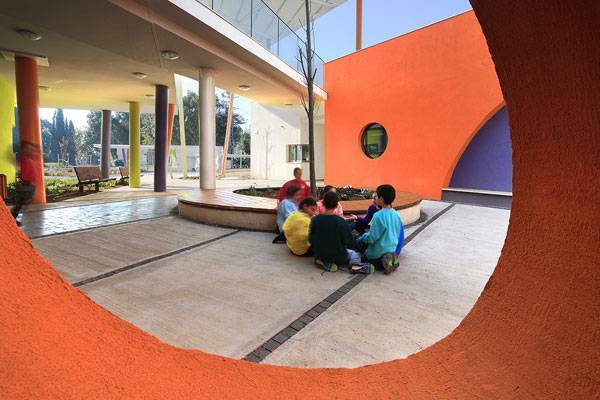 Rakafot School, by BO Landscape Architects and KNAFO KLIMOR ARCHITECTS, in Kiryat Bialik, Israel. 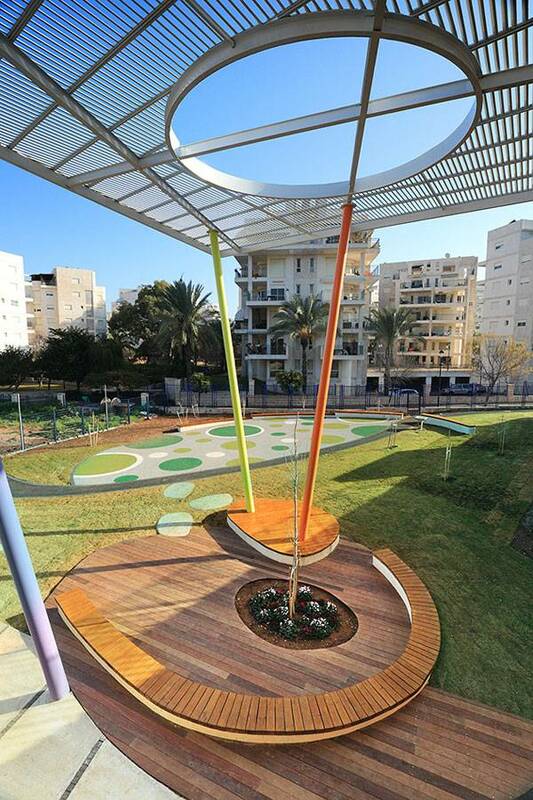 The Rakafot School is a project of BO Landscape Architects in Kiryat Bialik, a city in Israel’s Haifa District. This project was designed with the idea of reducing environmental impact and combining the lightness and diversity of nature, not only in the design but in the structures, too. 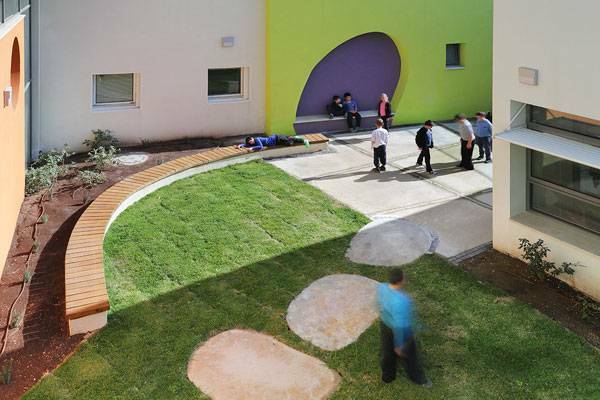 From organic shapes to color palettes, the architects intended to give the kids a closer look at the environment by creating an outdoor space where they could play and learn. The Rakafot School is a pilot project of Israel’s Ministry of the Environment. 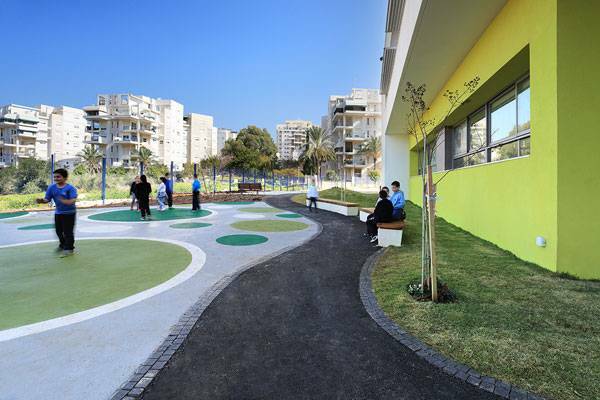 The main idea is to produce a line of ecology-oriented construction for the future so that environmental education will be an essential component of new schools in Israel. Awareness and preservation of the environment, efficient use of resources, and optimum learning conditions are the main concepts to adapt to the new constructions. Establishing a Connection Between the Interior and Exterior The plan for the project has a rectangle shape, and the buildings were placed to establish an immediate connection between interior and exterior, using courtyards, a patio, and a green roof to emphasize this connection. The buildings are connected with two bridges on each side of the main route, creating a continuous movement among the buildings and a green roof. The green roof is directly accessible from the first floor as an integral part of the building’s flow, providing great isolation while preventing refraction of sunlight. The designers call it a “visually interesting” learning space. It also offers the students the inspiration to maintain the environment, because they care for the plantings of herbs and spices in the roof garden on a daily basis. Making Good Use of Natural Light The buildings have been designed with large openings so the natural illumination penetrates on an important part of the indoor areas, bringing “nature” into the building. 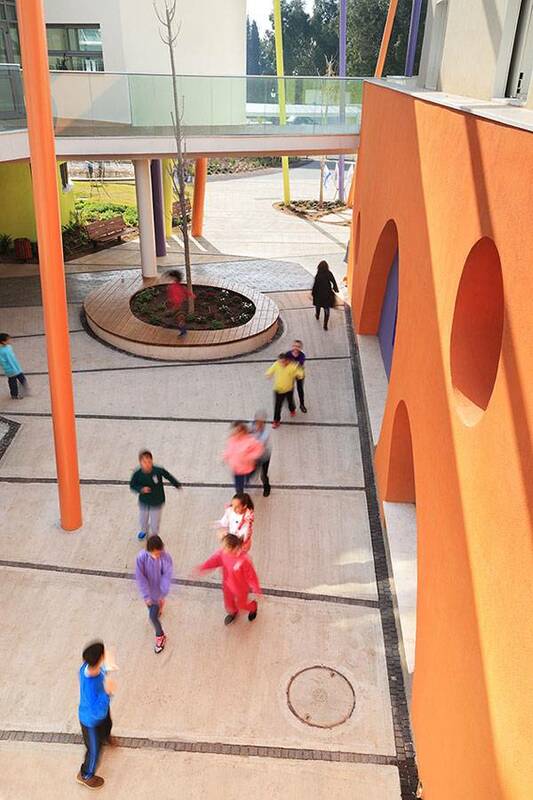 The central spine connects the entrance to the structures built around it; this is the focal point of the project, an outdoor covered space that lets the children interact with nature, forms, and color. Because of its dimensions and variable areas, this pedestrian route connects the school’s back yard, sport hall, and playing area. Single trees were planted and integrated throughout the school, becoming important characters in every space. The Adventure Path The designers also created the “adventure path” — a narrow yard area much more interesting and intriguing than a wider central pathway. 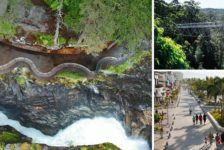 It is made of asphalt, begins in the parking lot, and passes through grassy hills and vegetation. 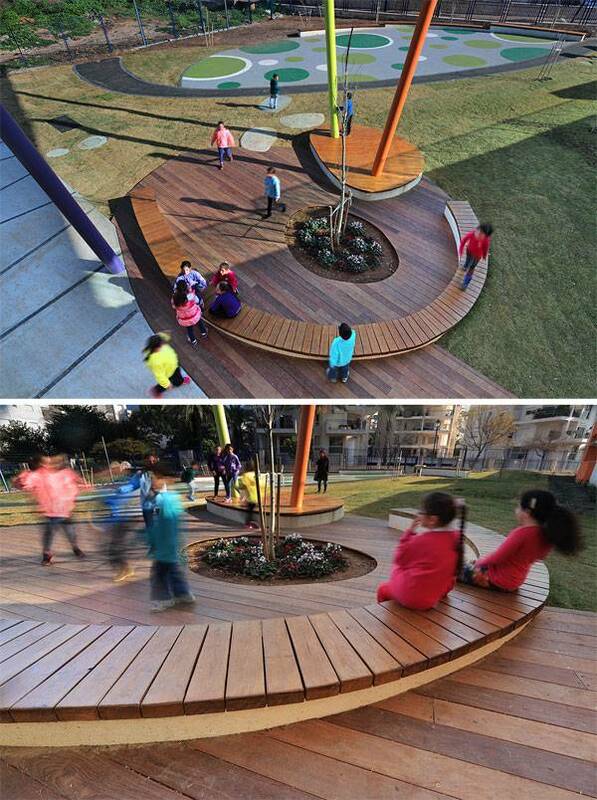 The designers consider the pathway an extremely meaningful play environment that facilitates movement and challenges the imagination. 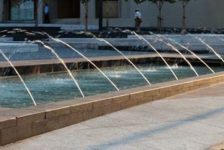 Importance of Water The architects designed “ponds” filled up with water and a diversity of flora and fauna – such as frogs — that help to clean the zone when mosquitoes show up. This area is used as an opportunity for the students to observe and learn about the variety of life forms. 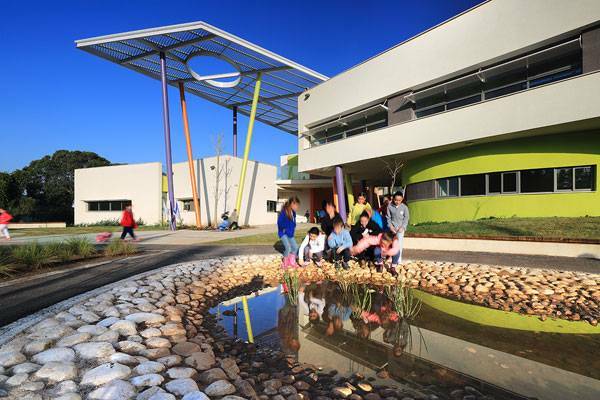 In this project, water is not just a decorative element; the pond collects runoff water after the abundant first rains at the beginning of the school year, to be used later for irrigation and gardening. This is a great example of how the designers combined the principles of green construction. 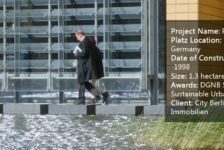 They also designed areas where the rainwater infiltrates the soil, and shaded areas with pergolas and local water-efficient plants. 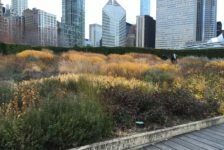 They designed some “micro-habitats” to restore local flora and fauna: For example, the butterfly garden in the main entrance, where they planted striking species of plants, is a welcoming habitat for the local butterflies. The Creations of Learning Spaces The school is formed by “learning spaces” that are meant to be used in informal gatherings, creating a unique interaction between students and teachers. The architects were very clear in their position: They designed not only a natural environment between outdoors and indoors, but they also gave the school an identity that reflects the value of traditions, culture, and the new vision of the community to encourage the sustainable design and forming learning scenarios, so the kids grow with the sense of taking care and, as the architects say, “redesign” the environment. 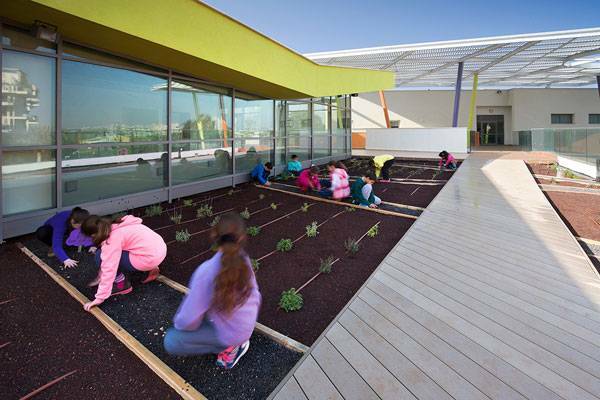 Sense, Observe, Discover All the outdoor spaces were designed so that students could sense, observe, discover, and learn about the environment, facilitating the creation of a rich and changing ecosystem. Every area has unique characteristics that are meant to host different age groups and diverse activities that encourage the students to experiment while playing in the outdoors. Top 10 Things to do with Your Summer Break!